When first starting out building a model railway, it usually comes as a shock to find building a baseboard isn’t quick or cheap. Here’s a tip that’ll get you a baseboard for under £30. While it’s not difficult to build your own model railway baseboard to do it properly can take longer than you might expect (see below). And if you don’t already have the appropriate DIY type tools already it can cost more than you might expect by the time you’ve purchased the wood, tools and materials. If you want to get started on a budget and are just dabbling and so don’t need something too permanent this tip is perfect. Before going further, however, two warnings. These baseboards aren’t for everyone. For starters, they’re small – ideal if just starting out and for N gauge layouts but won’t be suitable if you’ve got large plans in mind. 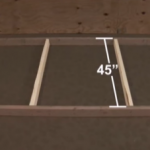 Secondly, these baseboards aren’t particularly stable, so if you’re planning sophisticated layouts with lots of scenery or want a large layout you’ll probably be better building your own baseboard. Here’s the tip, try it for yourself and don’t forget to say how you get on. Nip over to Amazon, or your local DIY store, and get a wallpaper pasting table or folding table. They’re available from under £30. Get a wood-based one, as you’ll need to drill and screw into it so the metal variety won’t work. Above two warnings were given for using these tables as model railway baseboards. One of these was around stability. You can, however, improve the strength of these tables by screwing some lengths of timber to the underside, across the longest length one on each edge and one down the centre. Hi Peter, thanks for writing. The most obvious thing that stands out is the electrical connections to the track which you don’t mention. How is this done? Sounds good, love the air field settings idea! Well the components are all fairly standard so shouldn’t be a problem. I’d try connecting a set of track up, check the locos get power on that stretch, and build it up adding one set of points at a time. Without instructions to the CDU you could easily get it wrong so I’d leave that ’till last and just prove the rest first. 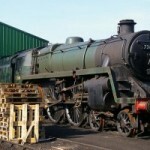 You mention DC in relation to the 2000, what are your locos, DC or DCC? I am disabled I got a small train set about 3 years ago it was a Christmas present, it still in the box, as my wife had MS I never had time to biuld it, I cant go down on my knees and dont have any balance, whats the best way for me to build my train set and what kind of board to use.